For our first Food Blog Challenge of the year we are making KFC, the Korean fried chicken variety. I’ve been wanting to make it for quite a while and this challenge offered the perfect opportunity. However I do regret not making this dish much earlier, because it is just so delicious. My version is inspired by Maanchi and The Woks of Life. It became a sort of hybrid. Don’t be alarmed by the list of ingredients, this recipe is easier than it might seem. The chicken is first marinated and dredged in potato starch. Then it’s fried twice for an extra crispy coating. 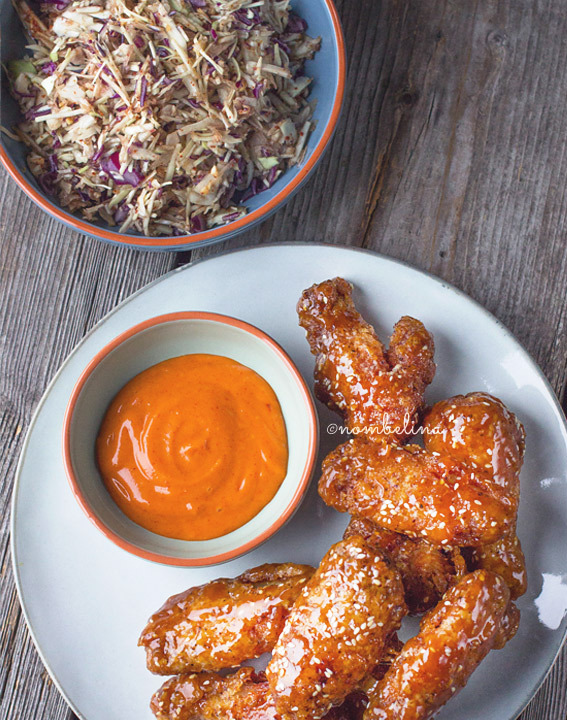 The fried chicken is then coated with a caramelized sauce and served with a spicy dip and fresh coleslaw. The caramel makes the chicken nice and sticky, almost like candy. You could also skip this step and serve it with just a dip. My guess is that the caramel does help keep the chicken crispy for longer. Mix the soy sauce with the grated ginger. Cut the wings in half and mix with the soy and ginger. Add the buttermilk and stir. Leave to marinate for a minimum of 30 minutes. Mix the potato starch with the pepper flakes and dredge the pieces of chicken one by one. Heat a fryer or pot of oil to 330° F / 165° C. Fry the chicken in batches for 10-12 minutes. Don’t fry to many pieces at once to keep the oil up to temperature. If your fryer or pan has a basket, leave it lowered and carefully slide the chicken pieces into the oil. Otherwise the chicken might stick to the basket. Put the fried chicken on top of kitchen paper covered with baking parchment to soak up excess oil. The parchment prevents the coating to stick to the paper. After the first fry you can leave the chicken to rest and make the sauce, dip and coleslaw. Once those are done you can complete the second fry on the chicken. Reheat the oil to 330° F / 165° C and fry the chicken 5-7 minutes. 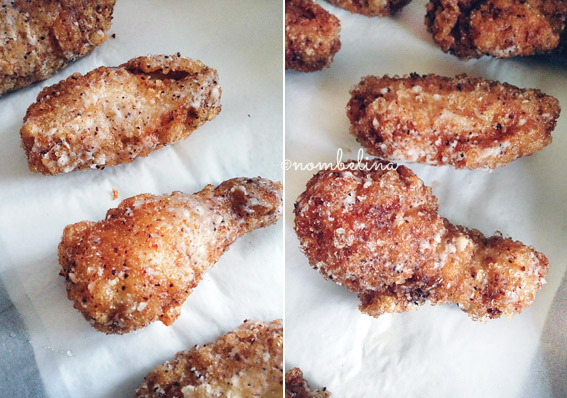 On the left the chicken after the first fry and on the right after the second fry. Heat the oil and gently fry the garlic until fragrant. Add the soy sauce, corn syrup, vinegar and mustard. Slowly simmer until thickened and add the sugar. Let the sugar dissolve and turn of the heat. Mix the twice fried chicken with the sauce and give the pieces a nice coating. Sprinkle with sesame seeds. You can make the sauce in advance, it will solidify once cooled. Gently reheat to make the sauce runny and coat the chicken with the sauce. Mix the mayo with the Korean pepper paste to make a spicy dip. You could substitute the pepper paste with a small amount of sriracha. For the coleslaw: mix the soy sauce with the peper flakes and sesame oil. Mix the red and white cabbage together with the dressing. 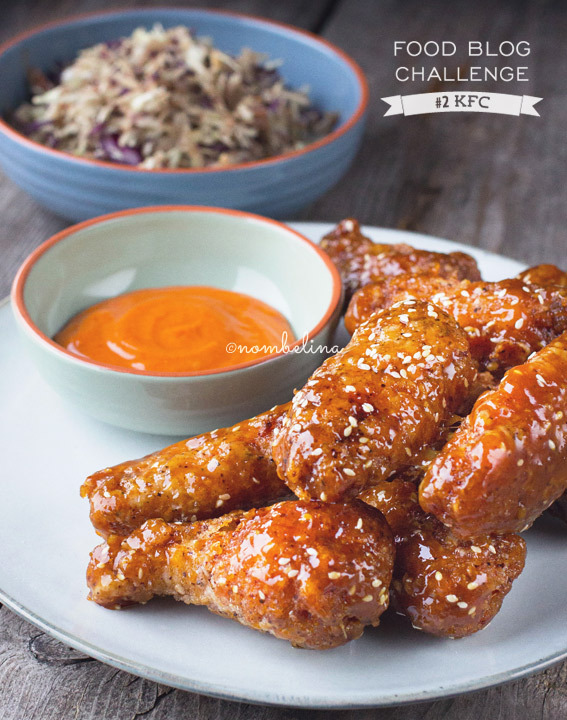 Serve the dip and coleslaw with the Korean fried chicken. Have it for dinner or as an awesome snack. I couldn’t resist making an addition to the chicken wings. 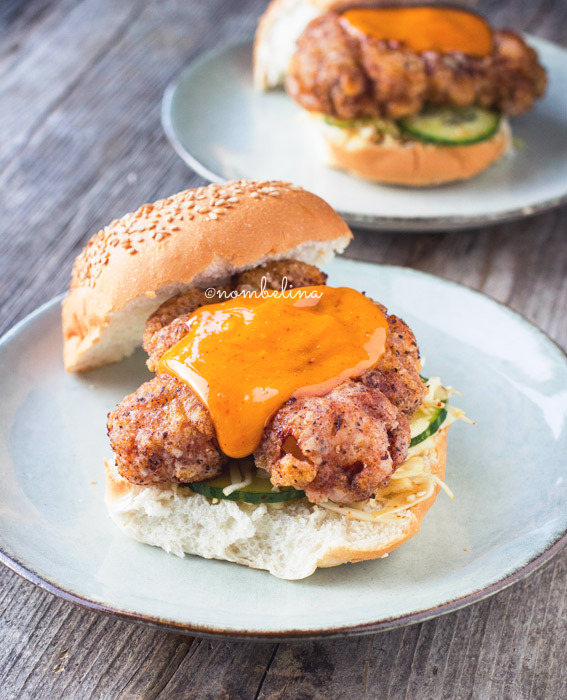 For these burgers I used boneless chicken thighs and omitted the sticky caramel sauce. The thighs are also marinated and fried twice. This time I shallow fried them 6-8 minutes on each side the first time and 3 minutes a side the second time. Reduce the oil if the chicken browns to quickly. 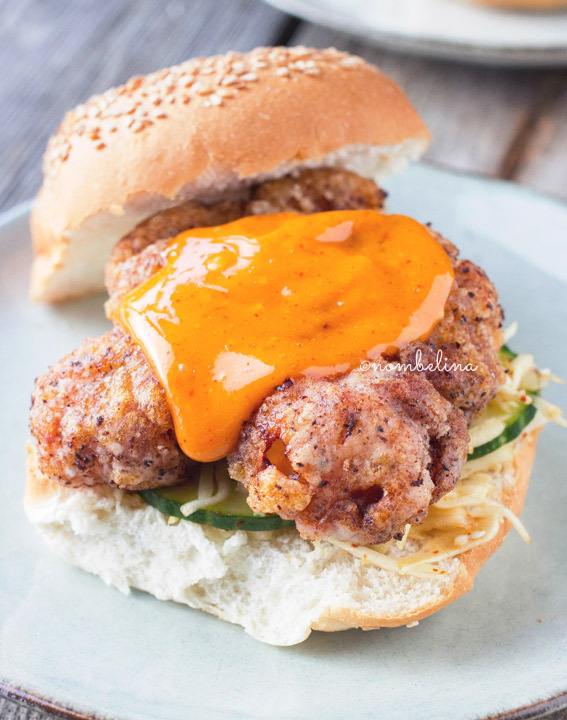 On top of the chicken is the same spicy mayonnaise and underneath a mix of white cabbage and slices of cucumber with the same soy sauce dressing that is on the coleslaw. 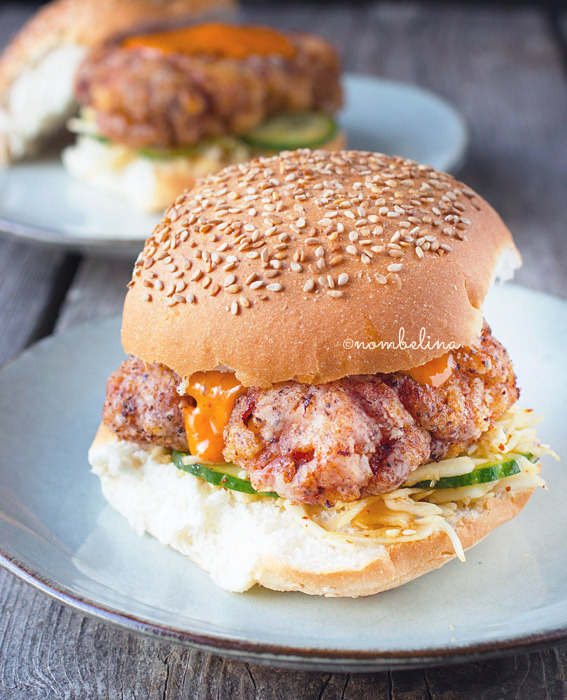 I really like these Korean fried chicken burgers! The coating was slightly less crispy than the chicken wings, probably because the thighs were skinless. Would you like to join in the Food Blog Challenges? 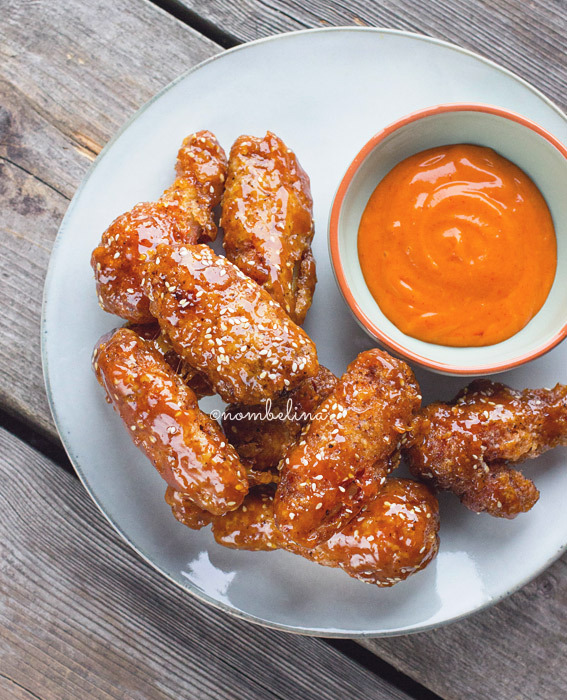 Make your version of Korean fried chicken and be inspired by Culinessa’s or my recipe. Send in your link or photo and we’ll share your submission. Februari’s challenge is Gua Bao! Steamed bun sandwiches, You steam the buns, open them up and fill them with whatever you like. Try making your own gua bao, but we wont hold it against you if you buy them at the Asian supermarket. We would love for you to join our Food Blog Challenge. 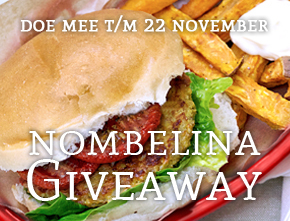 – Mention Nombelina and Culinessa in your blogpost. – Mention the Food Blog Challenge. – Use the FBC logo. Old challenges kan always be published. The logo’s to the challenges can be downloaded here.